We were sitting at a dockside bar in Key Largo, having a beer and deciding what our next move would be over some conch fritters. We’d had a couple shots at some permit that morning with our friend and guide Bruce Miller, but had to come in early. Now, me and the guys from Fly Lords were looking for a change of speed before making the drive back to Ft. Lauderdale. After a few minutes of watching dock tarpon reject pieces of conch fritter and scratching our heads, my buddy Jared spotted something in his Instagram feed and looked up. “We could fish for peacock bass in Miami?” We set off back north to catch peacocks. 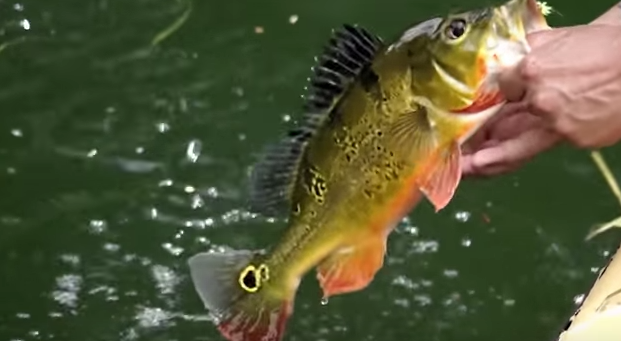 Native to the South America and particularly the Amazon, butterfly and speckled peacock bass were first introduced to the Miami canals in 1984. Their original intention was to restore balance to the canals ecosystem, which had been taken over by cichlids and exotic plant species. The one-time stocking took place with 3 different batches of eggs imported from Brazil to ensure genetic variation. The peacock bass took to the canals so well that there has never had to be an additional stocking, meaning there is no ongoing cost for the program. The peacocks serve their purpose well, controlling cichlid populations and eating invasive plant species. As a side benefit, they also provide a healthy economy to South Florida, with anglers spending between $5 million and $8 million dollars a year to catch peacocks.